These cookies are good for any occasion. All you have to do is change cookie cutters. They are made from simple ingredients that I always keep on hand. They have a softer texture and a wonderful flavor. The dough is a dream to work with! 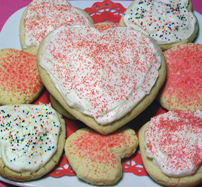 To decorate with sprinkles: Brush cut out cookies lightly with water and sprinkle with colored sugar or candies. Bake as directed. To decorate with frosting: Bake cookies as directed and cool completely on cooling rack. Frost with the following soft frosting and sprinkle with candies or melted chocolate. Place all ingredients in mixing bowl and mix until smooth. Frost cookies and enjoy.